The opening bounce of the Australian Football League season is a week away so Rags To Riches looks at the ante-post market on the Brownlow Medal, the award that goes to the footballer voted as the best and fairest in the competition. The Australian Rules football freak that is Gary Ablett took out the 2013 Brownlow Medal, the Gold Coast star overtaking Geelong’s Joel Selwood in the final round with a three-vote performance to win by one. Ablett is a two-time Brownlow Medal champion having won the prize when he was playing alongside Selwood in 2009 before moving to Gold Coast. Bookmakers have had to install Ablett as the Brownlow Medal favourite because, if they did not, punters located all over Australia would back him into favouritism in five seconds flat anyway. With Gold Coast shaping as a genuine Australian Football League finals contender for the first time since it rejoined the tournament in 2011, Ablett will be a popular Brownlow Medal pick because there is no doubt that it is easier to earn vote in a winning side than a losing one. However, there is a logical reason for betting around Ablett in the Brownlow Medal and that is the increasing quality of his Gold Coast teammates. Unless Gold Coast wins a lot more Australian Football League matches this season than it did last term, Ablett may struggle to earn the Brownlow Medal votes required to win the prize. For the record, Ablett collected 23 of Gold Coast’s 38 Brownlow Medal votes in 2011, 24 of Gold Coast’s 43 Brownlow Medal votes in 2012 and 28 of Gold Coast’s 62 Brownlow Medal votes in 2013. Ablett’s dominance of Gold Coast’s tally cannot go on forever because the Suns have a large number of high draft picks maturing, which is why Australian Football League fans believes that they will push for team honours in the near future. It is not that Ablett cannot win – remember, he won the 2009 Brownlow Medal while playing in a side full of champions at Geelong – but there is a footballer who represents better value and that is Fremantle midfielder Nathan Fyfe, who is available at odds of 12.00 with 888sport and Unibet. Of the 500 footballers with the most career Brownlow Medal votes, Fyfe has the 12th highest votes-per-game average and the fifth highest votes-per-game average among those men who will play in the Australian Football League in 2014. Chris Judd (0.83), Dane Swan (0.82), Selwood (0.82) and Ablett (0.79) are the footballers who have higher votes-per-game averages than Fyfe (0.77) but the Fremantle midfielder is a rising star in a rising team who has proven that he catches the eyes of the umpires who cast Brownlow Medal votes. Fyfe has played only 65 matches during Australian Football League regular seasons but he has been voted the best footballer on the ground in 10 of them, with seven second places and six third places. Fyfe made his Australian Football League debut in 2010 when Fremantle was not one of the premiership contenders. 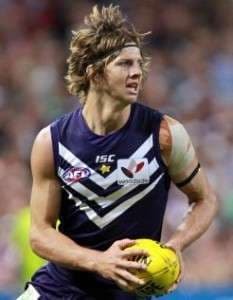 Fyfe’s four Australian Football League seasons in Fremantle’s colours have seen the Dockers finish the regular season ranked sixth (2010), 11th (2011), seventh (2012) and third (2013). A top-two position is within Fremantle’s grasp in 2014 because the Dockers have improved under Ross Lyon and they are strong at home, while the side’s biggest name, Matthew Pavlich, is in decline and not the Brownlow Medal votes hog of a few years ago. 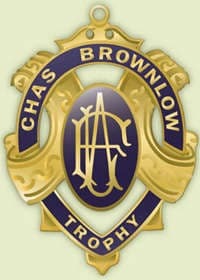 Recently the 18 Australian Football League captains were surveyed about whom they thought would win the Brownlow Medal. Fyfe received two votes, with Scott Pendlebury (four), Ablett (three) and Patrick Dangerfield (three) being the only other footballers to receive multiple nominations. Pendlebury plays for Collingwood, a team that is on the slide and that contains umpires favourite Swan, while Dangerfield’s Adelaide may not make the top eight. The Brownlow Medal goes to the best and fairest footballer of the Australian Football League season so punters should note that only footballers who do not receive a suspension during the campaign are eligible. On two occasions – Corey McKernan in 1996 and Chris Grant in 1997 – a footballer has missed out on receiving the Brownlow Medal because he has been banned during the Australian Football League season.